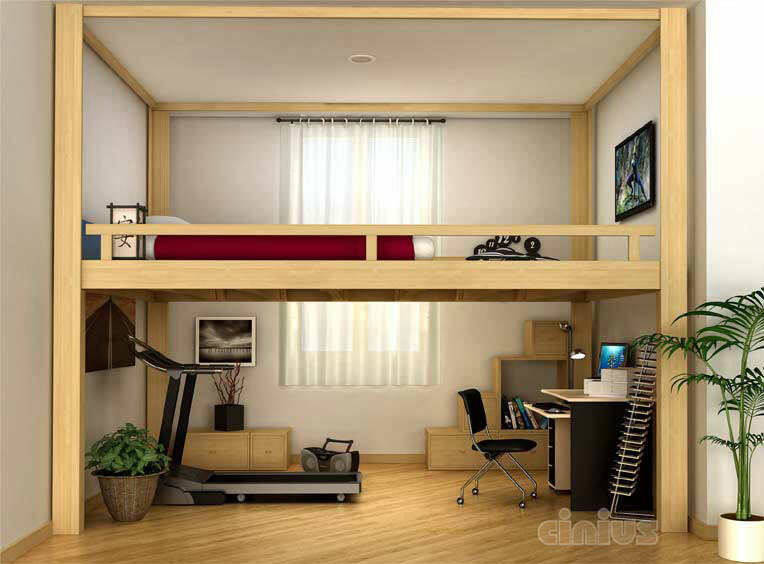 With Cinius loft beds everything becomes easy. 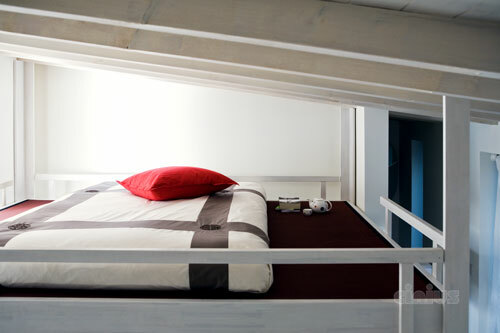 More leisure space Extending the frame from wall to wall reveals the full potential of our "Rising" loft bed. The supporting pillars are positioned against the walls so they don't obstruct the space below. Growing up with more space to play is every child's dream. 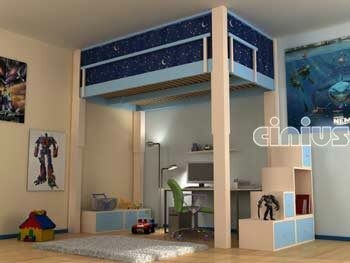 With the Rising loft bed the dream becomes reality and your child has a completely livable space. 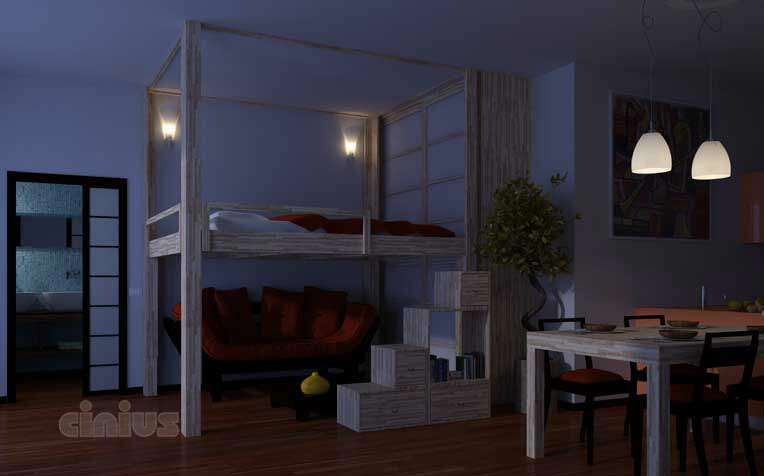 The pillars go from floor to ceiling so the frame can be positioned anywhere in the room. Made to measure in solid finger joint beech wood (maximum surface area 360 x 230 cm). 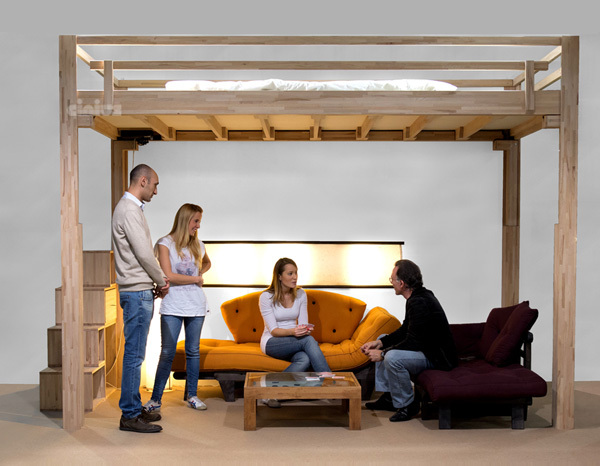 Tatami are used as a mattress base, ensuring the platform can breathe from above and below and making it easy to change the bed sheets. The modular cube steps (typically 120 cm in height) have a dual function: as well as allowing access to the loft they are also a bookcase, storage unit or chest of drawers. 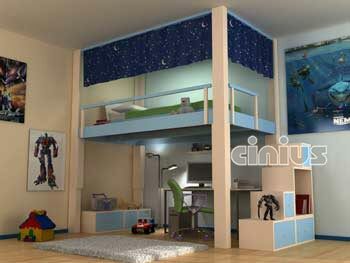 FAQ about Rising loft-bed What is the section of the bedposts rising? What is the minimum ceiling height? What is the minimum height to which you can turn down? The measures of the loft Rising are agreed with the customer at the order. 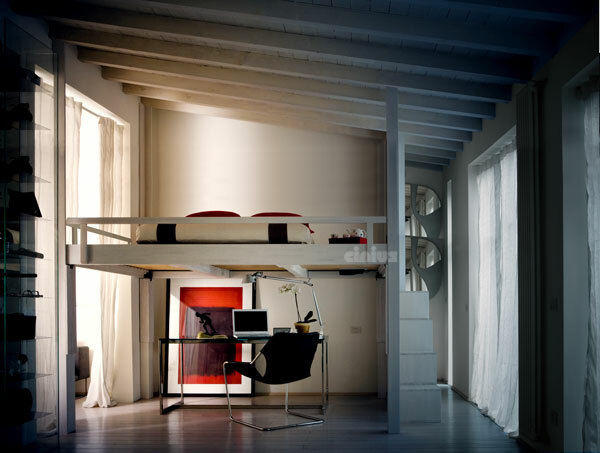 If, for example, the loft totally relieved develops a free space below 200cm., using the lifting system with standard stroke of 65 cm, the height provided with loft spaces will be lowered to 135 cm (200-65 = 135cm) It's therefore important in the choice of heights to consider which furniture will be used in the underlying part. What is the maximum size of the loft? Is there a longer stroke? The standard stroke is 65cm. On request motors are available with a stroke of 95cm. How heavy is the loft? For how long can Rising engines work properly ? The engines are tested for n. 10,000 movements. It's possible the replacement of engines. If there is a power failure? Can you replace the floor mat with other types of flooring? How can I use the top of the loft? Could I access the loft directly from under the structure? Yes, it's possible: in this case it will be created a special passage in the pavement of the tatami. If I want to put the loft across the room? How many walls has to be fixed to? Where should be positioned the control unit of the electric motors? Can you hide the control unit? What's under the floor Tatami? Can you raise the engines? If the loft coming down strikes some object below it? Can the loft be mounted above a normal door? No, it's better to evaluate the replacement of the door with a sliding one, or changing its opening direction. How many watts does it consume? 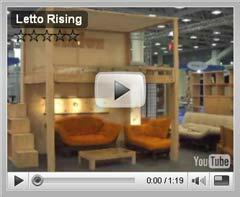 Can the loft drop up to be flat on the floor? Can you lift the loft with a person above? Can you ask for a high railing? Yes, a railing with height of 80-90 cm. It is available and recommended if there are children who use the bed. Can you have it in other colors? Can you use different ladders? 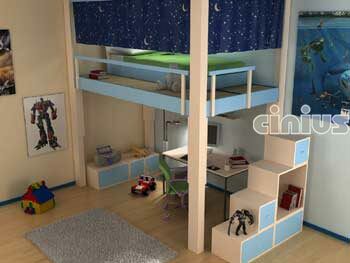 Besides the classic ladder-library, Cinius also realizes hooked ladders that can be laid to the loft. Is it possible to apply lights under the loft? Can you cover the underside of the slats by plasterboard ? Can the edge wooden ceiling	be removed? Can you assemble it on your own? For installation, it'S necessary to have a good manual skill. 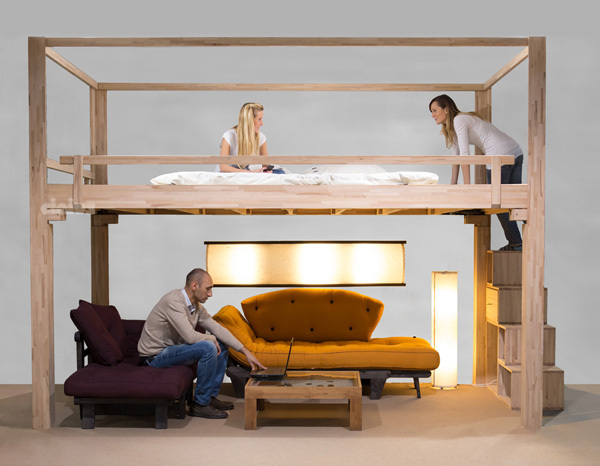 The loft should be assembled according to the specifications. It's essential to check with a spirit level the columns uprightness. In case of walls with corners that are not perfectly 90 degrees, it is necessary to adjust the attacks to the walls by little wooden parts. All Cinius products respect the legal warranty. If the walls are inclined or uneven? The loft must be rectangular or square. 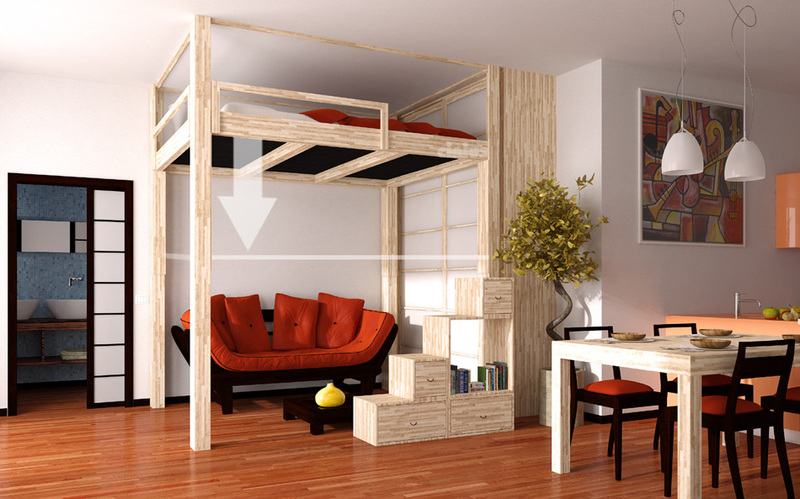 Any excessive space owing to inclined walls can be closed with wooden customized products.